Anyone who plays hockey enjoys the game for scores of reasons: it’s fast, physical, strategic, and both challenging and fun. And yes, when we all play the game we are simply in it to win it. Those of us who play the game also share one big thing in common: dealing with that horrid smell that lingers on our hands after a practice or a game. No matter how much we wash our hands after taking our gloves off, that familiar ‘hockey smell” seems impossible to get rid of. However a team of inventors in Canada have found a way for us hockey players – amateur, weekend warriors and professionals alike – to leave our stink at the rink. 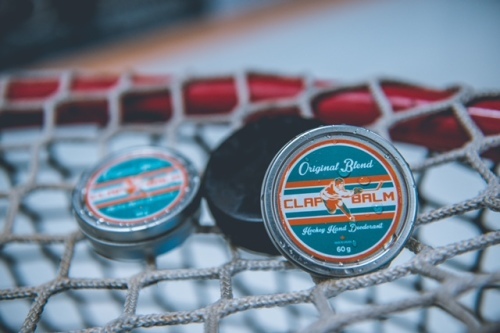 Meet Clap Balm, the world’s first hockey hand deodorant that works like a charm. There are all sorts of creams, soaps and antiperspirant lotions on the market, but nothing compares to this product. Once you put it on your hands no one will ever know you were at the rink. Dan Black of St. Thomas, Ontario, and Matt Laberge of Strathroy, Ontario, is the business duo who just developed this hand deodorant for hockey players here in Canada, the USA and around the world. Both are avid hockey players and know all about dealing with that foul “hockey smell” problem and they wanted to do something about it. The two are not scientists by any means, but rather innovators in business. Black is a business major at the University of Western Ontario, and Laberge is studying business management at Fanshawe College. Both of these esteemed institutions of higher learning are located in London, Ontario. The two also had some fun coming up with a name for their invention. We all know that no scout, parent, or crush wants to put up with that stench of yours after you leave the ice. This is why Clap Balm comes in handy, and the good news is that you can take it anywhere you go. It comes in small, round-puck-like-designed-container that easily fits in any of your pockets. Using it is a cinch too. After you remove the packing you simply use your fingertip to scoop up the deodorant out of the tin, and then you just apply the deodorant to your hands (make sure to work the deodorant hard between all of your fingers). “Once you follow these simple steps you can get on with your day without dragging the smell of hockey around with you,” says Black. All of the ingredients are totally natural. This is a great piece of mind for all men and women hockey players as this cream-based-deodorant that has an orange-citrusy-smell goes right into the skin. Clap Balm is also scoring big points in the big leagues, and has been tested out by players in the NHL, NCAA, OHL and Jr. Hockey leagues. Notables who use the product religiously include Bo Horvat of the Vancouver Canucks, Dylan DeMelo of the San Jose Sharks, and Derek Mathers of AHL, to name a few. Even better, this new product will work in any temperature, but it’s best to keep it at room temperature. Clap Balm has just hit the market and it will undoubtedly be a huge hit among men and women hockey players of all ages. After all, everyone wants to smell nice after grinding it out on the ice. Each tin retails for $9.99 and you can also purchase three tins for $29.97 or a team pack of 24 tins for $192.00. 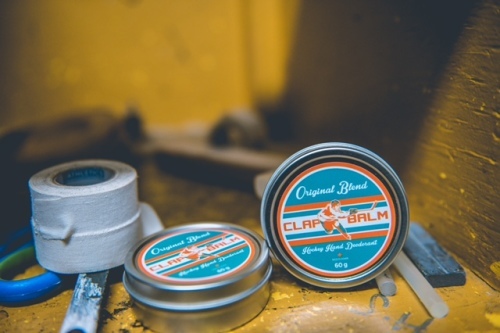 If you are worried about smelling like crap after playing hockey, then you will want to get your hands on Clap Balm – literally. And keep one thing in mind after you use it: everyone will certainly appreciate it.